Big news in the Bruegel-sphere this week with new evidence that the famous “Landscape with the Fall of Icarus” is indeed not by Bruegel the Elder. The soon to be released publication, The Brueg(H)el phenomenon, from the Royal Institute for Cultural Heritage (KIK/IRPA) in Brussels, written by Christina Currie and Dominique Allart, puts forward evidence that the painting was painted near the year 1600, decades after Bruegel’s death. For years scholars have been postulating that this work was not characteristic of Bruegel’s works in several key areas. Manfred Sellink, for example, in his magnificent 2007 monograph “Bruegel: The Complete Paintings, Drawings and Prints,” reviews the history of the attribution question. The painting has always looked “off” to me. While it was the first Bruegel picture that captured my attention as a 17 year-old student all those year ago, each subsequent viewing of the painting indicated that something was not quite right about it. The most problematic aspect of the painting for me rests in the depiction of the peasant and his horse. The figures do not have the typical heft of Bruegel’s figures. Something about the man and the horse give the impression that they could almost lift off the painting and float into the sky. 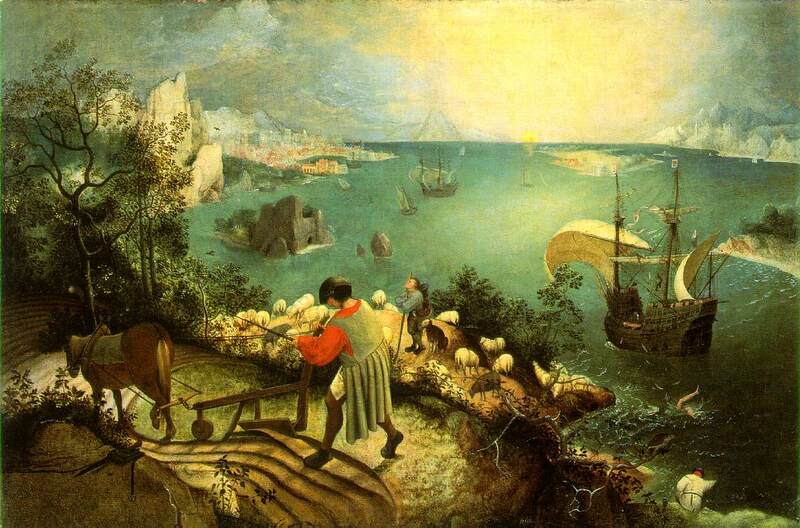 The painting is one of the most famous of Bruegel’s works, with W. H. Auden writing an oft-quoted poem about the work. We look forward to learning more about Currie and Allart’s findings with the release of their research early next year.